Thursday the 11th December 2008 and the members of the Darkest Essex Area Group gathered for the last time this year. We celebrated the fact by consuming a large lemon drizzle cake, half a box of chocolates and gallons of tea and coffee. All this must have had a good effect because lots of modelling was done too. Mark Fielder may have the piazza but we have the bread board, complete with vice and a hinge jig. Is this the smallest work bench in 2mm modelling? The recently arrived Masterclass Models Midland Van etches spurred our host Melvyn into a flurry of modelling activity. Much to our surprise he had made a start before our meeting. To help things along he has made a jig utilising pins in mdf which allow the various layers of etch to be aligned using the etched registration holes kindly provided. One body had been completed prior to our meeting and a rather bad photo gives you some idea what it looks like. David Short continued to work on his Association 08 kit which is well advanced, hopefully some photos will appear here soon, David! David Eveleigh was batch building wagon chassis, which may seem boring but having done it myself, it certainly gets rolling stock build quickly. I spent the evening painting the coping stones on the wall which will grace the right hand back corner of Marks Quay, more later. I also took some photos of the new Oxford Models coach, but they did not come out well enough to include here. The model is very good and I can recommend it. I shall be adding a couple to my stock box before long. 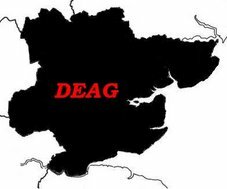 On behalf of the DEAG I would like to wish you a Festive Christmas and Happy modelling New Year. See you in 2009.